Below, you’ll find a list of events organized by the Initiative für Interdisziplinäre Medienforschung (or Medieninitiative, for short), which I coordinated at the Leibniz Universität Hannover from 2011 to 2014. For current and upcoming events (talks, conference panels, etc. ), see the calendar page above, as well as the main blog page. December 12, 2013: film screening and discussion: Upstream Color (2013) — curator: Shane Denson. 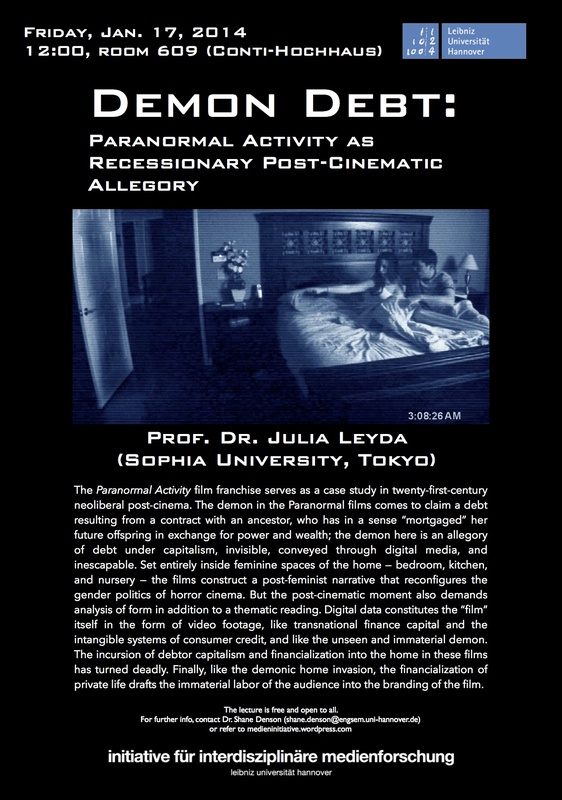 January 17, 2014: Julia Leyda, “Demon Debt: Paranormal Activity as Recessionary Post-Cinematic Allegory.” Guest lecture in Shane Denson’s seminar “Digital Film, Chaos Cinema, Post-Cinematic Affect: Thinking 21st Century Motion Pictures.” See here for more information. April 10, 2013: Film & TV Reading Group (topic: Imagining Technological Innovation; texts: Franco Piperno, “Technological Innovation and Sentimental Education” (in: Radical Thought in Italy. A Potential Politics. Eds. Paolo Virno and Michael Hardt. Minneapolis & London: University of Minnesota Press, 1996. 122-130.) 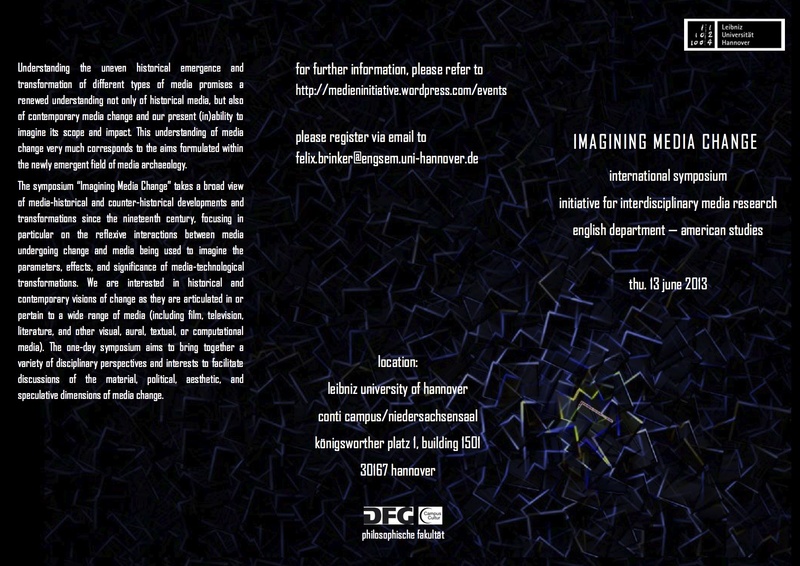 and Jussi Parikka, “Introduction: Cartographies of the Old and New” (in: What Is Media Archaeology? Hoboken: John Wiley & Sons, 2012. 1-18.) – moderators: Felix Brinker, Shane Denson, and Ilka Brasch) — See here for more info. April 17, 2013: “Imagining Media Change” film series, screening #1: Flash Gordon (1936) — curator: Florian Groß. See here for more info. May 8, 2013: Film & TV Reading Group (topic: Imagining Cinematic Transformation; texts: Francesco Casetti, “The Relocation of Cinema,” NECSUS 2 (2012): online here; Thomas Elsaesser and Malte Hagener, “Conclusion: digital cinema — the body and the senses refigured?” (in: Film Theory: An Introduction through the Senses. New York and London: Routledge, 2010. 170-187.) – moderators: Ilka Brasch, Felix Brinker, and Shane Denson). See here for more info. May 15, 2013: “Imagining Media Change” film series, screening #2: Forbidden Planet (1956) — curator: Florian Groß. See here for more info. 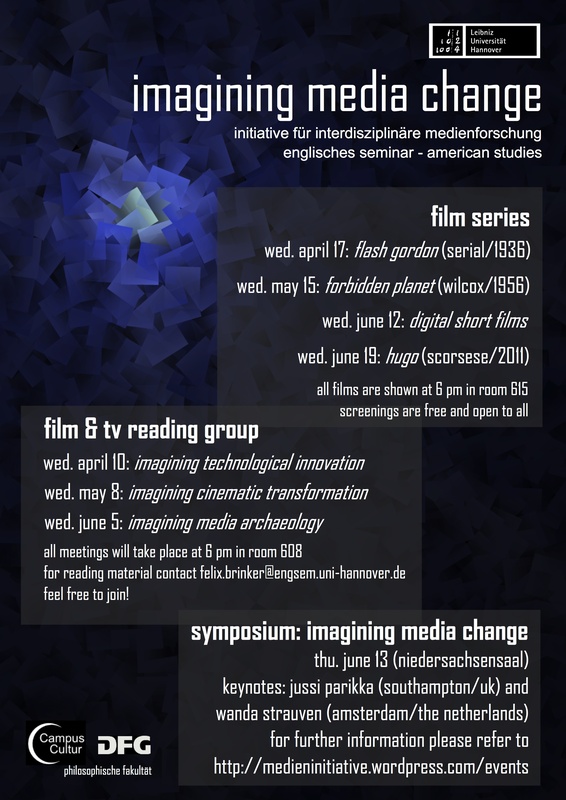 June 5, 2013: Film & TV Reading Group (topic: Imagining Media Archaeology; texts: Jussi Parikka, “Imaginary Media: Mapping Weird Objects” (in:What Is Media Archaeology? Hoboken: John Wiley & Sons, 2012. 41-62); Wanda Strauven, “The Observer’s Dilemma: To Touch or Not to Touch?” (in: Media Archaeology: Approaches, Applications, and Implications. Eds. Erkki Huhtamo and Jussi Parikka. Berkeley: U of California P, 2011. 148-163.) – moderators: Shane Denson, Ilka Brasch, and Felix Brinker). See here for more info. June 12, 2013: “Imagining Media Change” film series, screening #3: digital short films (various) — curator: Felix Brinker. See here for more info. 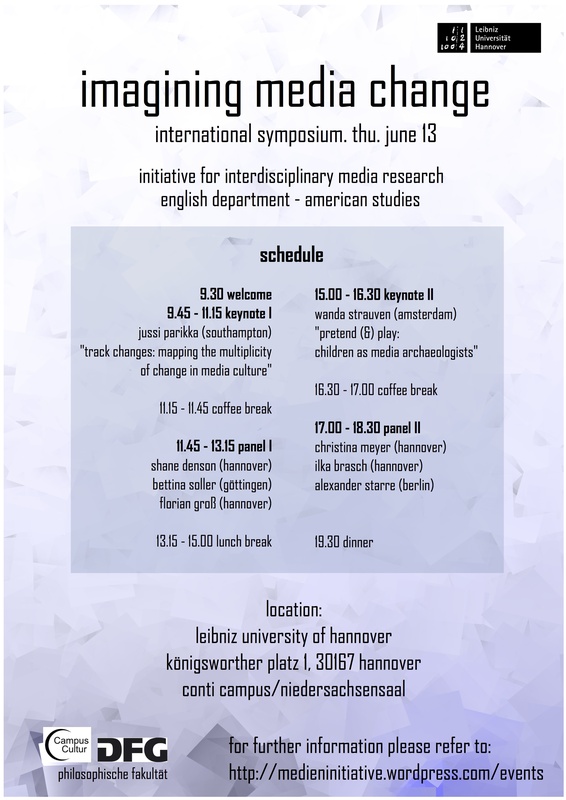 June 13, 2013: Symposium: “Imagining Media Change.” Keynote speakers: Jussi Parikka (Southampton, UK) and Wanda Strauven (Amsterdam, Netherlands). 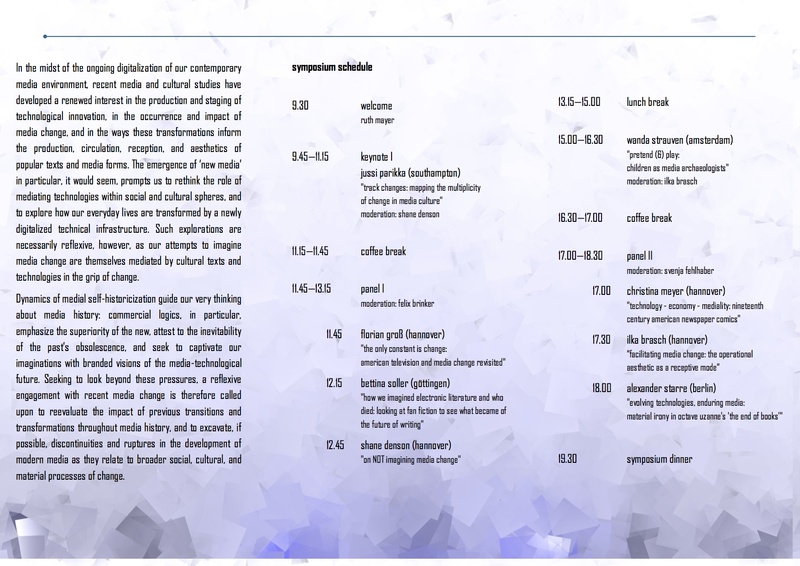 — See here and here for more info, and here for the final program and abstracts.